The 43rd Mississippi Infantry of the Confederate States of America is the only regiment to have used a camel militarily east of the Mississippi. Referred to as the Camel Regiment, it was organized in 1862 and surrendered in 1865. 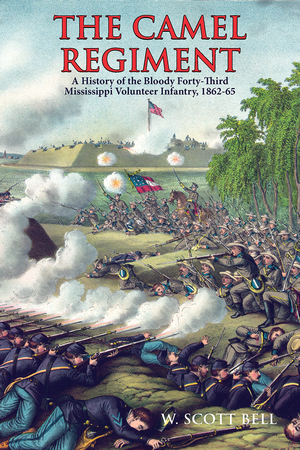 Using a variety of resources, the author provides a roster of the regiment along with detailed information on the formation, battles, and controversies surrounding the men. From the acquisition of the African dromedary Old Douglas to carry baggage and musical instruments through his death at Vicksburg and the fate of his fellow soldiers, Bell provides an entertaining historical narrative of this little-known chapter in American history. W. Scott Bell retired from the US Postal Service and has spent decades researching the history of the War Between the States. He is a life member of the Sons of Confederate Veterans (SCV) and the Blue Bonnet Society of the SCV. The United Daughters of the Confederacy awarded him the Jefferson Davis Medal for his work presenting history in the classroom and his efforts to preserve Confederate monuments. His great-great-grandfather, Cpl. John K. Bell, was a member of the 43rd Mississippi Infantry.